Rubislaw Quarry in Aberdeen was the source of the stone that gave the city its Granite City nickname. The biggest man-made hole in Europe will is to be put up for sale on the open market for the first time in 150 years. Rubislaw Quarry, dubbed ‘the hole Aberdeen came out of’, was the source of the stone that gave the Granite City its name. For Sale signs are due to go up at the landmark in the west end of Aberdeen on Thursday inviting offers. Although it was closed in 1971, the quarry’s legacy lives on through the city’s buildings and through global landmarks such as London’s Waterloo Bridge and the Houses of Parliament as well as the New York Opera House. Laughably the quarry was sold off by Aberdeen Town Council 38 years after it first opened in 1740 as it was not believed to be a source of good building material. They sold it back to the Skene family in 1788/9 for £13. Over the course of the following 200 years however, an estimated six million tones of granite was excavated from the quarry and was heralded as a high quality building material the world over. At 142metres (466ft) deep and 120metres (394ft) wide, the oval shaped quarry is roughly the size of 1,200 Olympic-sized swimming pools, covering approximately five acres. It has filled with water over the last 50 years. The overall site for sale from Thursday is 7.3acres. Chartered surveyors AB Robb Ltd have been instructed to market the property on behalf of owner Bixen Ltd. 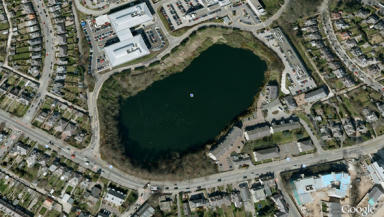 Managing Director Alex Robb said: “This is definitely one of the most unusual sites we have been instructed to sell. It is well known throughout the city but very few people by comparison will have seen it. Some of the most renowned local examples of Rubislaw granite can be seen in buildings by notable architects John Smith and Archibald Simpson built in the early 19th century. Internationally, the granite was used in the Sebastopol docks and a temple in Japan.